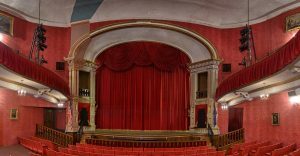 Tibbits’ proscenium arch. The swatch of color up the proscenium arch and ceiling on house left shows the original color scheme of the 1800s and the eventual restoration of the interior. We’re in a great location for routing, near the Michigan-Indiana border, halfway between Detroit and Chicago and between Indianapolis and Grand Rapids (easy access off I-69, just north of I-80/90 and about 30 miles south of I-94).